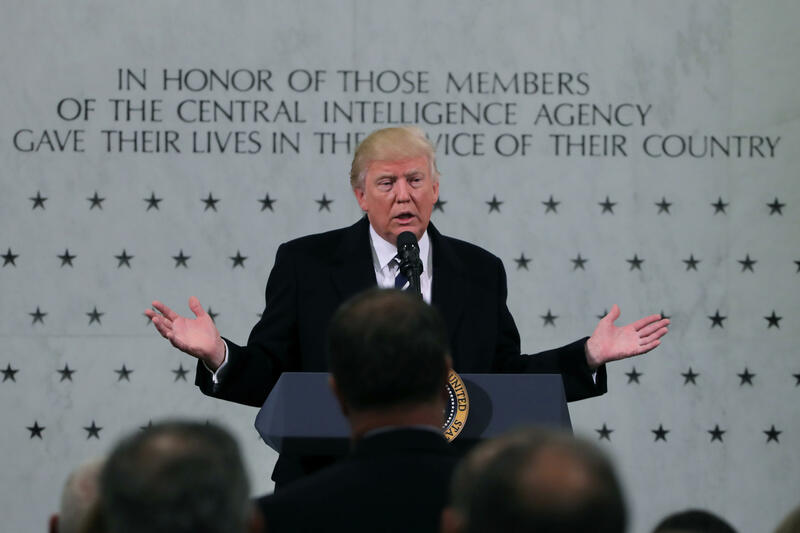 U.S. government sources tell CBS News that there is a sense of unease in the intelligence community after President Trump's visit to CIA headquarters on Saturday. An official said the visit "made relations with the intelligence community worse" and described the visit as "uncomfortable." Authorities are also pushing back against the perception that the CIA workforce was cheering for the president. They say the first three rows in front of the president were largely made up of supporters of Mr. Trump's campaign. An official with knowledge of the make-up of the crowd says that there were about 40 people who'd been invited by the Trump, Mike Pence and Rep. Mike Pompeo teams. The Trump team originally expected Rep. Pompeo, R-Kansas, to be sworn in during the event as the next CIA director, but the vote to confirm him was delayed on Friday by Senate Democrats. Also sitting in the first several rows in front of the president was the CIA's senior leadership, which was not cheering the remarks. White House press secretary Sean Spicer on Monday denied that there were "Trump or White House folks" in the first rows. "There were no Trump or White House folks sitting down. They were all CIA (unintelligible). So, not in rows one-through-anything, from what I'm told." Spicer said at the White House briefing Monday. He did not address whether Pompeo invitees were in the first rows. A source who is familiar with the planning of the president's CIA visit saw Spicer's briefing, however, and firmly denied Spicer's response was accurate. Officials acknowledge that Mr. Trump does have his supporters within the CIA workforce, many of whom were interspersed among the rank and file standing off to the president's right. There were about 400 members of the workforce who RSVP'd for the event out of thousands who received an invitation in their email late last week. Officials dismiss White House claims that there were people waiting to get into the event. Intelligence sources say many in the workforce were stunned and at times offended by the president's tone which seemed to evolve into a version of speeches he'd used on the campaign trail. The intelligence community sees itself as above politics even though as president-elect, Mr. Trump was critical of it and accused it of politically motivated leaks. The CIA was Mr. Trump's first official agency visit for a reason, it was to signal a new beginning. At the outset of the speech, the president expressed his support for the CIA, "There is nobody that feels stronger about the intelligence community and the CIA than Donald Trump." But it is what he said later in front of the CIA's revered Memorial Wall (a monument to CIA officers killed in the line of duty) -- complaints about the media's coverage of his relationship with the intelligence community and its assessments of the crowd size at his inauguration -- that may be harder to erase from the minds of the intelligence community. CBS News' Steven Portnoy contributed to this report.